While we at GSROC do not condone or advise walking a dog off leash at all, most pet owners have had the experience of your dog slipping past you, your partner or your kids at the door to get out to a family member in front of the house. 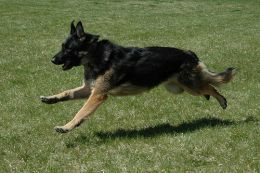 Most shepherds, NOT ALL, but most, by the time they hit 2 years old will just hang out until you decide to go in…but before they hit two years old, no matter how many obedience classes you have done, will run-and stay JUST out of your reach. I know I have been that crazy lady running down the street exactly 3 feet behind my dog screaming her name and she just keeps running, suddenly completely deaf to my voice. Then, all of a sudden, 5 or 6 houses down her hearing comes back and she stops and waits for me and the impending scolding and walk of shame back home. I bring this up because the other day I was standing out on my street, and one of my lovely (I mean it, I like her) neighbors comes driving up the street on her way out…and right behind her…loping and easily keeping up with her car is her 10 month old LAB. Big grin and happy as can be to be going out on a run with mom. We all waved her down, and she stopped immediately. She was terribly embarrassed, mad and also amused… you know the feeling. So she finally gets Max (names have been changed to protect the innocent) in the car and heads home. Everyone who had a dog just offered her words of encouragement and smiles…I am sure many of us were secretly thankful it wasn't us. What I did find interesting was that although we probably all had advice, or a good trainer we could recommend, or whatever…we all just gave her support and sent out some quiet love. That is the part of the dog world that I love. 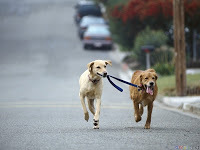 Having a dog, or two, or three, or uhhmmm, four can be a lot of work, but in additon to the joy the dogs bring-the love, the smiles, the camaraderie from fellow dog lovers you get when you are out and about… totally worth it.